Like week-old pizza leftovers, sometimes we can’t help revisiting old positions over and over again. Sometimes, it leads to greatness, a new-found appreciation for the original idea, and a re-focused goal to work towards. Other times it leads to food poisoning. I’m still not sure where the Fortuner fits on the scale of things. What the hell are you on about Dan? To properly explain my opinions of the Fortuner, you first need to understand the strange and convoluted path that has led to it finding its way onto dealership lots. It started, of all places, with Winnebago. In the early 80s the motorhome manufacturer saw an opportunity to take the then utilitarian HiLux and turn it into more of a lifestyle piece. A canopy was installed, step through cab conversion added, and a fully carpeted interior with a rear seat tacked on. It served as a marketing test bed for Toyota who then developed the original 4Runner. Another generation later the 4Runner gained a second set of doors and a tin lid making it the first ute-based wagon. In the early 90s they were replaced in Australia with the similar Prado. Overtime however the Prado has spread around the belt until its current iteration, larger than the full-size wagons it was supposed to slot under. Toyota once again saw an opportunity to bring to the market a mid-sized ute-based wagon, although this time it’d be called the Fortuner. The problem is the 4Runner never actually stopped production. It’s sold en masse in the Americas, with looks to die for and a host of engine options including a 4.7L V8 at one stage… What gives Toyota? Enough ranting, Toyota felt like reinventing the wheel rather than introducing an already successful vehicle, but what’s the Fortuner like to actually live with? Kicking open the door and sliding your backside into the deep buckets the first thing you’ll notice is the Fortuner is a damned nice place to pound out some kays. The age of rough and ready 4WDs is definitely over, but that doesn’t necessarily mean so is the age of capable 4WDs. But more on that later. The GXL we had the keys to was optioned up with leather trim making it feel considerably more expensive than its mid 50k price tag would otherwise indicate, while they can be hell in Australian summers they more than make up for it with ease of cleaning. Something parents and patrons of late night kebabs would appreciate all too well. Stepping up to the GXL from the base model GX also meant we were handed a set of remote entry keys too, while it’s mostly a gimmick, it is damn handy not needing to fumble for keys to get in and out of your 4WD. I still hate push button starts though. 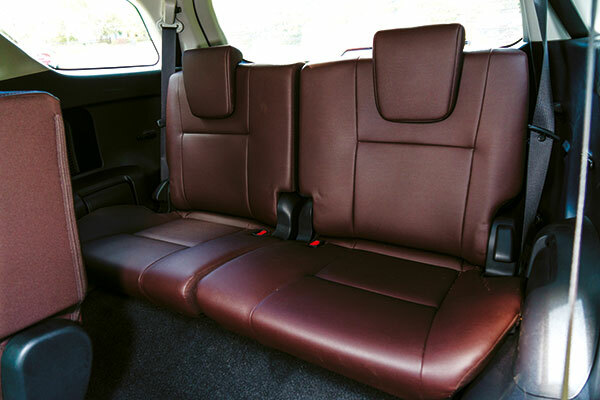 Our test model was fitted with the premium interior packed that not only ticked the leather box but also added power adjustability to both front seats. In typical Toyota fashion it’s light on in terms of every day tech. The sat-nav is basic at best, there’s a distinct lack of additions like adaptive cruise control, lane keep assist, or blind spot monitoring, and the A/C controls are old-school dials. For some it’ll be perfect, for others it won’t be. 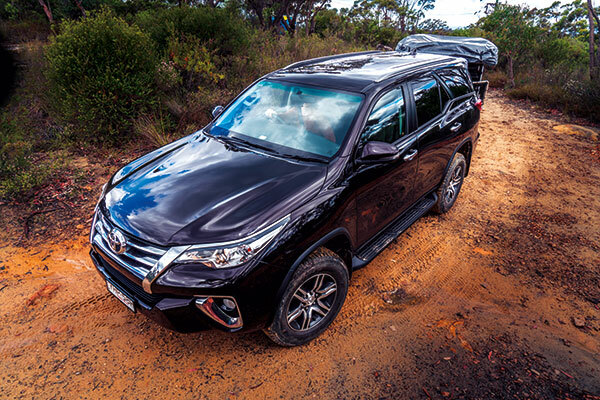 Despite its pretty exterior, the Fortuner is more HiLux than mini-Prado. As such, its NVH levels are a little more…agricultural. 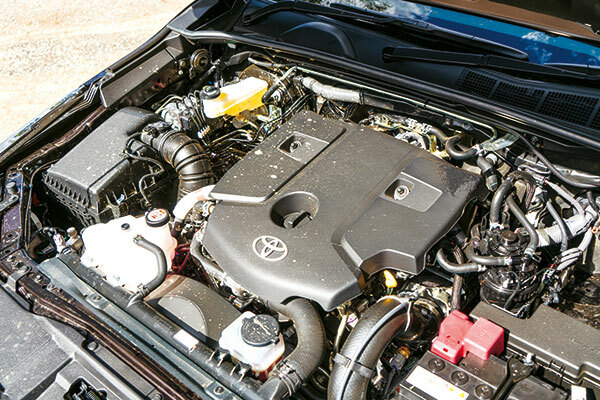 Under the bonnet lurks the same 2.8L turbo-diesel Toyota is throwing in everything at the moment, but it’s significantly louder than its more expensive brethren. That said, it’s also a few hundred kilos lighter than the similarly powered Prado resulting in significant improvements in performance and overtaking on road. It feels a lot nimbler, and less like an old-school 4WD because of it. 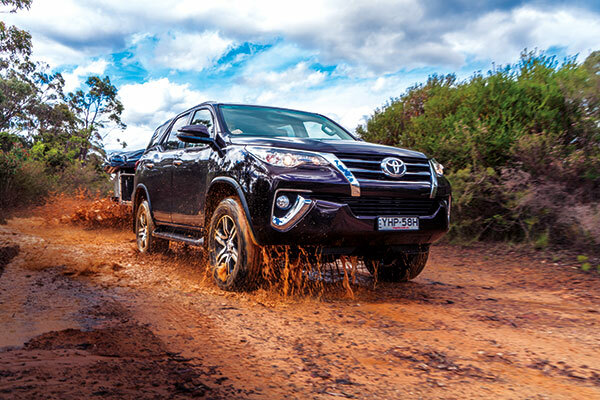 Despite the Fortuner being the smallest offering in Toyota’s offroad line-up it’s still no lightweight, in fact its overall dimensions are a hair larger than an 80 Series LandCruiser, so there’s plenty of room for the whole family. It’s a true 7-seater with two buckets up front, a 3-pew bench in the middle, with a 3rd row making room for two more passengers right up the back. 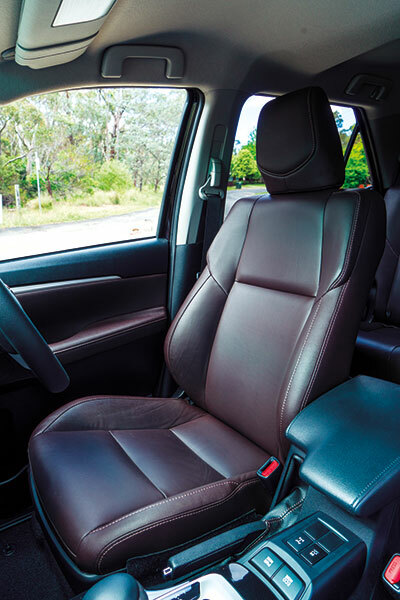 Unfortunately, while the third row seats are some of the most comfortable on the market, they swing up to the side like a 1992 Pajero significantly eating into the storage space and blocking vision out of both rear quarter windows. 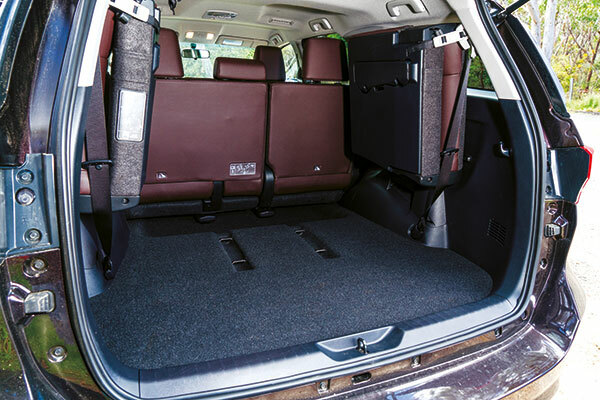 By comparison the Isuzu MU-X has the third row slip down into a false floor. There’s better ways Toyota. Back seat passengers have reasonable leg room so if your kids are old enough to have beards of their own they won’t have their knees around their ears just to come along for the ride. They’re treated to A/C ducting all the way to the rear as well with a roof mounted control system, something far too many 4WDs fall short of even to this day. They do however need to negotiate a 60/40 split seat with the split on the wrong side, it’s also light on with power outlets for back seat passengers, just one 12V outlet to share between five possible passengers, and no mains power until you step up into the Crusade, which picks up a 220V outlet. 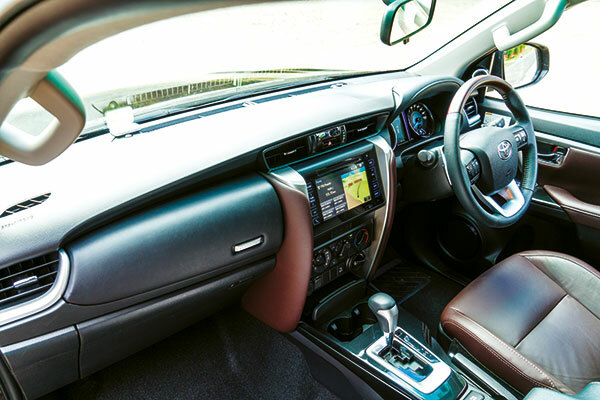 The Fortuner also misses out on the in-built DVD system its more expensive siblings often come equipped with, although in an age of iPads and… you know… things to actually look at out the window, it might not be a deal breaker for your circumstances. It also picks up full curtain airbags all the way to the rear, something that any safety-conscious parent would be glad to see. 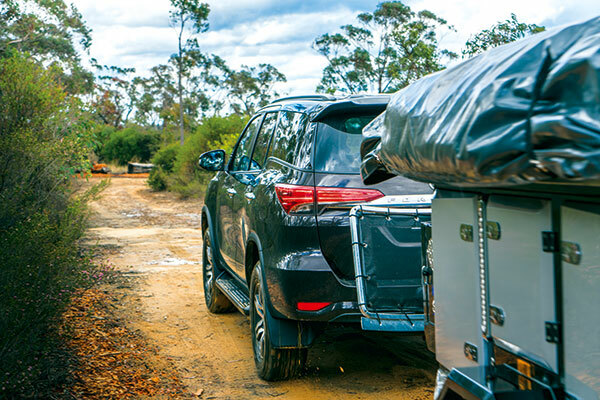 This is a camper trailer magazine, so how does the Fortuner go actually towing? Well good and bad. Let’s rip the Band-Aid off first though. The bad side is it’s simply not very big or powerful. The automatic version we had has a tow-rating of 2800kg (manuals bump that up to 3000kg), but even that’s pushing it. The engine feels lethargic with weight behind it, revving high and struggling to find the right gear, and the rear suspension simply can’t cope with 280kgs of tow-ball weight. That said, after-market modifications can reasonably fix most issues so they’re not deal-breakers if your heart is set on the Fortuner. On the long haul you’ll struggle with the “smart” in car system locking you out of maps as soon as you’re rolling. Apparently, Toyota forgot passengers exist. The spare tyre has been dropped down from the tailgate, meaning the reversing camera points straight at the hitch, allowing for easy solo connecting. Toyota’s included trailer sway control too, something you hope you’ll never need but is a great feature to have. Fans of manual-cog-swappers lose 30Nm compared to the auto’s 450Nm, but it’s available 200rpm lower at 1400rpm, making it a seriously viable option for towing in offroad situations. Step up into the top-tier Crusade and auto-levelling headlights mean you’re not blasting fellow travellers in the eyes just because your camper is a little heavy on the tongue. Up until now it might sound like I’ve been rubbishing the Fortuner, far from the truth, it just doesn’t shine in the big-wagon tow-tug categories. But it does shine offroad. 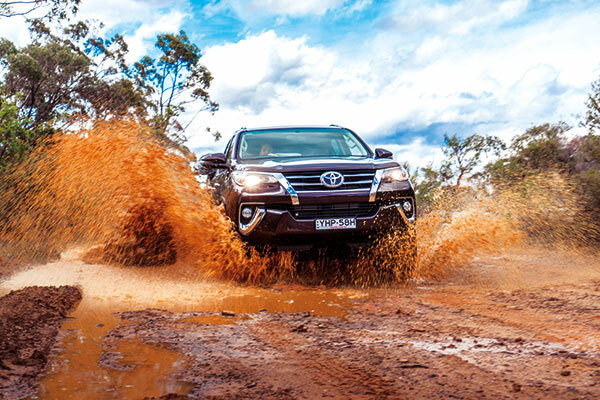 With its incredibly capable HiLux underpinnings the Fortuner is a traditional offroader and performs like one. The independent front end performs flawlessly on corrugated and undulating tracks, with the hydraulic steering providing positive feedback even in tough terrain, something the newer electric systems struggle with. When the going gets tough and the front starts lifting wheels the slinky coil rear end comes into its own. It’s a tried and tested setup that’s been used in just about every Toyota rear end for the last 30 years. The 5-link arrangement allows the rear end to easily walk over obstacles while still providing a modicum of passenger comfort. While the Fortuner’s traction control system does help, the fitment of a factory rear locker allows it to keep pushing forward as long as at least one rear wheel has grip. Match that with impressive approach and departure angles and the only hold back you’ll have is fear of dented panels. There’s plenty of ground clearance underneath too, and when it runs out Toyota have lined the vital components with steel bash plates. There’s no fancy full-time 4WD systems, or terrain management modes like you’ll find in the LC200 or Prado, and that’s just fine by us. In fact, the only drawback to the Fortuner’s offroad prowess is the spare tyre underneath. It not only causes concerns for puncturing your get out of gaol free card, but also limits fuel capacity to 80L. Still plenty of range for safely doing most 4WD journeys, but you will need to watch for fuel stops. I mentioned before that Toyota filled a niche with the Fortuner and that couldn’t be more true. While it might seem like yet another offering from a company with more 4WDs than any other it’s a significantly different beast altogether than either the LC200, Prado, and even the HiLux. Despite it being similarly sized to the Prado it hides its size significantly better, it feels like the smaller 4WDs of old, with enough room still for the whole family. 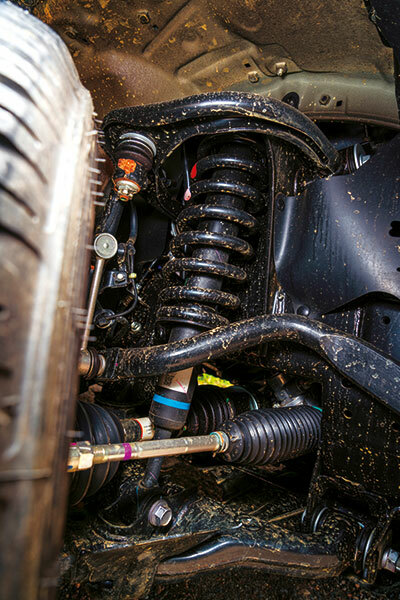 The 4WD system is tried, tested, and endlessly reliable. The only difference between it and a 20-year-old 4Runner is the inclusion of a rear diff lock, and you engage it with the flick of a dial. Look, let’s not sugar coat it. If you want to tow the biggest, baddest offroad caravans around the Fortuner shouldn’t be too high up your wish list, but for anything sub-1800kg it’ll take it on with aplomb. 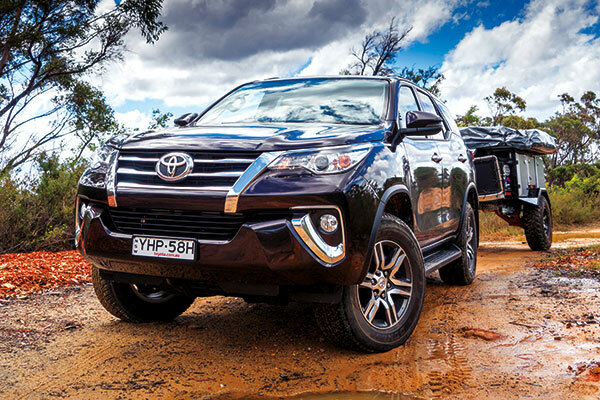 Accessories galore, genuine offroad capability, and Toyota’s renowned build quality and reliability. 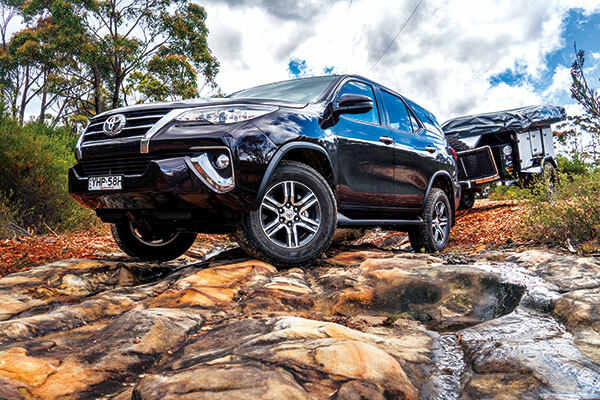 If you’re in the market for an honest 4WD that’ll do what it says the Fortuner might be your perfect old-school 4WD with a new school face. Check out the full tow test in issue #124 of Camper Trailer Australia magazine. Subscribe today for all the latest camper trailer news, reviews and travel inspiration.